The SC330 has a servo system that ensures perfect register on tight jobs. The frame size is 500x660mm. Frames can be made locally at a low cost. A special “after glow” feature cures even high layers of ink. The SC330 is compatible with tooling from existing equipment. Setting up the SC330 is very simple and fast, which makes it suitable to complete very short runs. Apart from being a cost-efficient alternative to rotary printing due to the low costs of mesh and frame, flat bed screen printing is also a good match for digital print as the screen can be very fast for day to day production of labels. The SC330 screen printing unit from Grafisk Maskinfabrik has a printing area of 330 x 330 mm (13 x 13") and is designed and engineered to perform screen-printing of the highest quality possible on flexible materials. 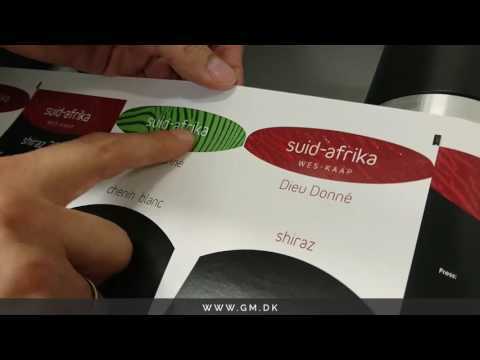 After printing, the ink drying is undertaken by UV-curing (GEW). The SC330 is compatible with tooling (screens) from existing equipment. Preparing and setting up the SC330 is very simple and fast, which makes this machine suitable to complete even very short runs. Apart from being a cost-efficient alternative to rotary printing due to the low costs of mesh and frame, screen-printing also has several other advantages e.g. easy set-up and less waste. Web width 50 - 330 mm 2 - 13"
Diameter max. Ø500 mm 19.7"
Core diameter 25 - 152 mm 1 - 6"
Core diameter 76,2 or 152,4 mm 3 or 6"
Frame size 660 x 500 x 30 mm 26 x 19.7 x 1.2"
Print area 330 x 330 mm 13 x 13"
Exhaust Ø125 mm, 800 m³/h. Outside.